Cornerstone Life is the route that connects every person in the church to one another. We want to see every person living up to their greatest potential in Christ. We desire to empower every person to walk within the liberty of Christ to build fellowship and community in the church. Cornerstone Life is about …Jesus & Discipleship. It is summed up in…Love God & Love Others. It is our desire to foster deeper relationships in the church body and revitalize small groups in the church. · Bible Studies, all together or with similar interests, ages and stages of life. · Ministries, enabling you to use your gifts to serve and glorify the Lord. · Missionaries, to keep in touch with and hear updates from. · Prayer, so you can pray together, for others and add your requests and praises. How Can You Join? Get connected with each other. Just by being here, you are already a part of Cornerstone Life. Join us as we grow together in Christ, share in one another’s burdens, and build deeper, more intimate relationships in the body of Christ. 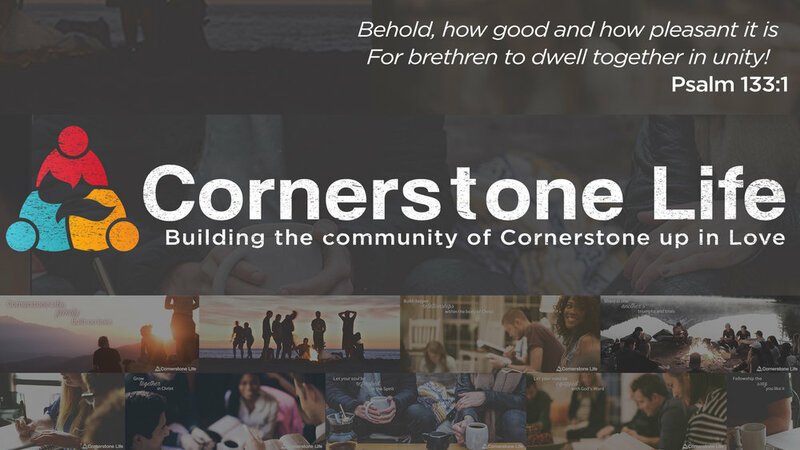 This site is your hub for connecting to Life Groups, ministry events and opportunities, building personal connections and entering into relationships within the part of the church we call home, Cornerstone Calvary Chapel. •Follow friends, join groups, post prayer needs & explore.